The oil has a pretty thick consistency so a little goes a long way with this product, having said that it melts into a lightweight formula when applied on to the hair leaving it silky smooth and glossy as it states. The mixture of Argain oil along with the omega oils deeply nourishes the hair shaft whilst adding a glossy shiny finish to the hair which personally I really like.  I have been only using this product for few weeks and so far so good. Whilst of course there is no miracle product to a quick fix on dry hair I think this product is great at preventing damage and keeping your hair nourished. Unlike most oils this is not one that comes with a pump this one comes with a dropper which is a cool concept although I personally am not a huge fan of simply because it can get a bit messy but that is just a matter of personal preference. As I mentioned many times before I am a big fan of anything Volumising and this product did not fail to impress me and honestly does what it says. Personally I find that some volumising products either do nothing or leave your hair feeling sticky? This is not the case with this product it added a lot of volume to my hair whilst still leaving it soft to the touch. The formula is lightweight and has a fine mist when applied the hair. Rush suggest to apply 4-6 mists on to the roots which I then tend to rub in to the hair roots followed by blow drying the hair as most volumising products activate when heat is applied to the hair. Overall I think this is such a great and affordable range of products. 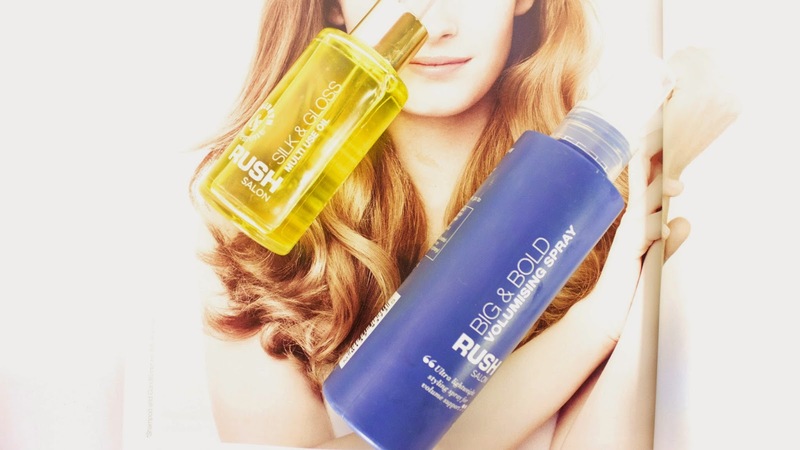 Rush have created salon quality products easily available to all of us as they are now available at Marks & Spencer stores as well as online making it easy to get hold of their products. 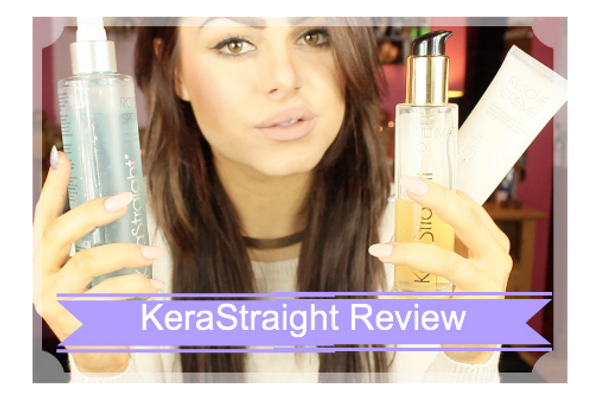 Hello Beauties, I have a review with a Giveaway for you today. Now haircare is something I am very in to having fine, and damaged hair due to my bad bleach habits I use to have and being blonde for over six years I am on a journey to get my hair back to its best condition and whilst theres many things that contribute to healthy hair a good hair care is a big part of it. Having tried many ( tons in fact) of hair products I find that it takes a lot to impress me and these products have honestly been amazing hence why I decided to give one of the products away to one of my readers. This is such a lightweight yet still nourishing oil perfect for any hair type to add moisture to the hair shaft. This is my go to pre blow dry styling cream it leaves my hair feeling silky soft yet still voluminous and non greasy. This has become my staple, non sticky formula that actually gives you lots of volume and body to the hair. Today we’re talking make up in particularly the products I use for my base. Having oily , sensitive and break out prone skin I find it pretty difficult to find products that work on my skin and don’t cause irritation / breakouts but I have been very happy with the products I am talking about today as they cover beautifully and leave my skin looking flawless. Primers is not something I have always used nor do I ever tend to stick to using one but I am loving this L’oreal Magique number it leaves my skin smooth and glowy without leaving my skin looking oily on top of the Borijious Healthy Glow Foundation these products work beautifully together both products were implies purchases after watching That Pommie Girl’s Updated Make Up Routine video and I am totally hooked. 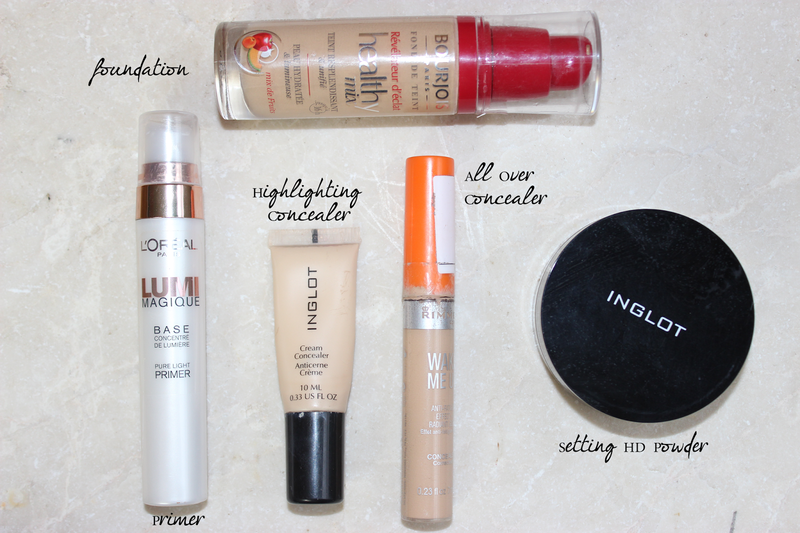 Concealers are an essential for me and the two concealers I am loving at the moment are the Rimmel Wake me Up Concealer and the Inglot Cream Concealer for highlighting both work great but the Rimmel one is lot more lightweight in formula and coverage. Having oily skin a setting powder is a must and I am loving the Inglot Translucent Illuminating HD powder its super light weight , mattes your skin but due to the illuminating finish it does not leave your skin looking cakey, flat or dull. What are your Base essentials/ favourites? In just over a week I am turning 23 ( eek no longer Taylor Swift ‘I don’t know about you but I’m feeling 22) Since I’ve hit the 20 mark and left the teen years it seems to be flying by so fast! I have been doing a little bit of internet window shopping and made up a small wish list of the beauty products I am currently wanting and needing to try a girl can wish right?haha! I am really into skincare at the moment as I am sure you noticed judging by the products seen on my Wish list. Firstly are the gorgeous REAL TECHNIQUES BOLD METALIC BRUSHES stunning on the outside and having seen these in store they simply are a make up must have. Moving to a little skincare related products first is the LA ROCHE POSAY SERZONIC ZINC SPRAY which I have heard so so many good things about and having used La Roche Posay products I just know I will not be disappointed when I try this product. Next is the PIXI GLOW TONIC ELIXIR which I only recently have heard about but the reviews I have read have been amazing and for someone who has combination skin this product sounds like just what my skin needs. After all that exfoliating and toning of course its important to repair the skin and this is where the CLARINS MULTI CORRECTIVE SERUM comes in handy!! This serum is more on the pricer side but is suppose to be very beneficial to the skin which I have no doubt about as after I tried the Clairns Multi Corrective Moisturiser around a year ago I was convinced this range is worth a try. Back to the cleansing I not only love the look of this MAGNITONE LUCID FACIAL BRUSH but cleansing brushes are great for exfoliating and keeping your skin clear so yes please. Moving to some make up bits I have been really into glowing skin lately but haven’t seem to have found a highlighter which ticks all the boxes for me yet so I really want to give this BENEFIT GIRL MEETS PEARL a go. On the talk of glow how beautiful does this HOUR GLASS AMBIENT LIGHTNING BLUSH get in my make up collection now please. Next product is one that pretty much everyone has or loves URBAN DECAY NAKED PALETTE and I want to join y’all and finally get one after using my friends palette I fell in love. Lastly are these NEW CID COSMETICS i – GLOW BRONZER I think the image speaks for itself gorgeous colours and would look gorgeous on the skin. 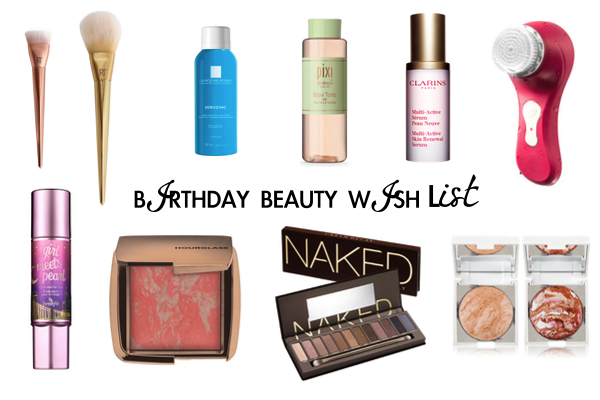 Whats products are on your Beauty Wish List at the moment? I have been really into skincare lately and think it is so cliche but so true that your make up looks as good as the skin underneath it and if your going to invest in anything beauty wise skincare is defiantly an area worth spending a little more dollar on haha but of course that is not to say you have the break the bank to get great products as that is not the case at all. I think the key to great skincare is firstly using products which are designed for your skin type and two choose wisely. A few months ago I reviewed a cleansing balm from AD Skin Synergy which you can read here which I absolutely adored and AD Skin Synergy offered to let me try out one more product from their range which I was super stoked about not only is the brand all organic it contains so many beneficial ingredients and oil blends to help repair and restore your skin and is paraben and chemical free. ” The product is an award winning natural anti-ageing face oil, scientifically proven with outstanding results. ” I have been using this oil for over two months now and have been very happy with the results and benefits the oil has had on my skin. I notice when I apply this at night in the morning my skins feels hydrated and nourished , this product is fabulous when you’ve got dehydrated skin and need a bit of a pick me up hydrating product, works wonders after those late nights with your girls in town ha! I am one of those people who are very picky when it comes to oils as I don’t particularly like ones that leave your skin feeling oily for ages this is another little thing that I noticed about this product once applied on to the skin it sinks in to your skin pretty fast as your skin absorbs it. This is simply a gorgeous product with an amazing ingredient list of which all is natural, although it is a little on the pricey side a little goes a long way and I can assure you this will last you for months, as I mentioned above I have had mine for over two months and not even half way through the product. Once again AD Skin Synergy have impressed me with yet another product from their range. 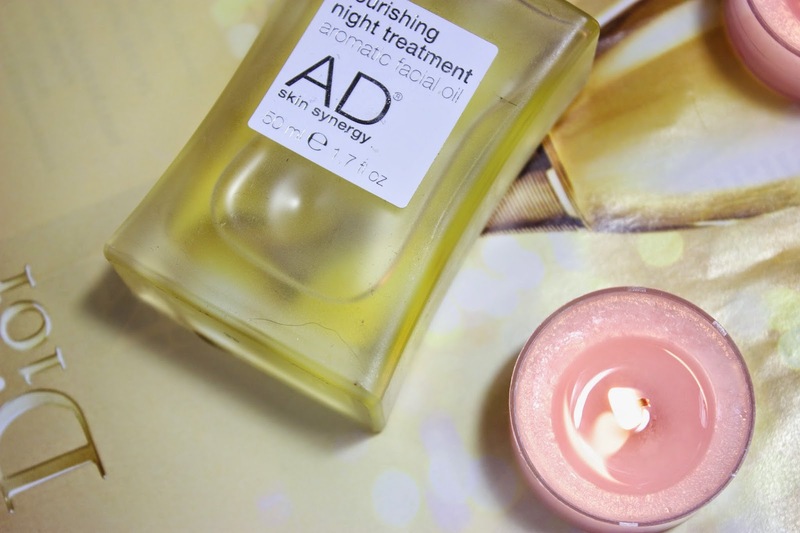 Have you tried AD Skin Synergy Range Oil? What are your favourite Night Treatments?